On the weekend of August 31st – September1st 2013 Northumberland National Park and the Altogether Archaeology Project organised a professionally led volunteer survey at the site of a stone row alignment, a type of feature usually regarded as Neolithic. The stone row, situated 1 km south-west of Great Longbrough Farm, runs for 134m approximately north-south up over the scarp of Standingstone Rigg. There are three sections still extant. Some stones are off-set from one another, offering support to the hypothesis that the row may have originally formed an ‘avenue’. 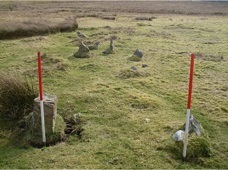 Volunteers used both manual survey techniques with theodolite and plan drawing, and high tech GPS equipment to record the stone row, pits, cairns and other earthworks at the site.